Hurix Systems Pvt. Ltd., a leading provider of learning technology solutions has been recognized by Outsouricng Gazette as “25 Most Promising QA/Testing Services Vendors 2015” in its July 2015 focus issue. Outsourcing Gazette, a premier platform that targets visionaries and strategists in the outsourcing community, evaluated over a hundred companies in Quality Assurance and Testing space on their competencies, delivery expertise and diverse other factors. Based on that, they came up with 25 Most Promising QA/Testing firms who understand the clients’ processes and are able to align well with them from the beginning of the software development life cycle. 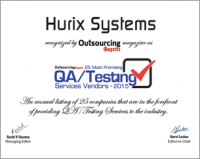 Hurix has established a highly efficient QA service offering which is independent. Being in the industry for over 15 years, Hurix has expertise in eLearning, ecommerce, web-based and mobile application testing as well as automation testing. Our solutions are end-to-end, cost-effective, and use cutting-edge technology. Subrat Mohanty, CEO and Co-founder of Hurix Systems ensures that Hurix provides top notch QA services by keeping a constant line of communication with the Head of Quality Practices. He quoted, “Quality Assurance is not just a service but an independent practice, empowered to deliver the highest quality”. 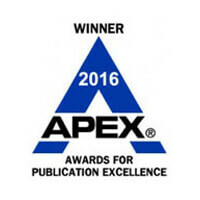 Hurix is the leading digital content solutions provider to global educational publishers, institutions and corporates. Our product and service solutions provide effective, compelling, and engaging digital content, across traditional and newer mobile platforms, formats and devices. Hurix is the preferred Thought Partner of future market leaders, at the convergence of technology and content, in learning. Hurix has won two consecutive (2014-Gold & 2013-Silver) Brandon Hall Awards for both of its innovations in the field of learning technologies, Mobile & Content Authoring respectively. Also, Hurix was recognized by the World Education Congress as one of the ’25 Best E-Learning Companies’. This year, Hurix has been awarded, “The leading training outsourcing company” by the Training Industry Inc.’s Outsourcing Companies Watch List for 2015. For more information, visit www.hurix.com. Aditya Chakravarthi, aditya.c@hurix.com,+ 91-22-61914888. Hurix Systems Pvt. Ltd.